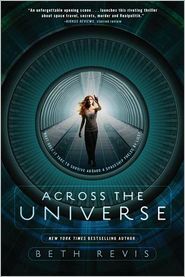 Today I want to celebrate the paperback release of Beth Revis’ ACROSS THE UNIVERSE! I’ve known Beth for a long time now and not only is she a fantastic writer who isn’t afraid to delve into deep issues, but she’s been a great friend to me over the years. She was such a support to me when I moved from Korea to the States and dealing with the adjustments. Beth truly is a beautiful person. It’s evident in how she treats people and the heart she has for her readers. I can only say wonderful things about her. ACROSS THE UNIVERSE, written by Beth Revis, takes the reader on an adventure set in a spaceship bound for a new planet. Seventeen year-old Amy, frozen with her parents to be part of the group to land on this new planet, wakes up 50 years too early. And it’s not a computer glitch. It was done on purpose. As Amy deals with the culture shock of being on a spaceship with very different rules, she also is on the hunt to discover who is unplugging—and killing—the frozens. Because her parents might be next. I know. It’s full of awesomeness. And I’m giving away two paperback copies! But that’s not all. Because January 10, 2012, the sequel, A MILLION SUNS, will be released. So I will be giving away a preordered hardcopy too! And I think it’s even better than ACROSS THE UNIVERSE. Ohhhhh!!!!! Comment below to enter. You can get 1 extra point if you recommend the book to your local librarian, 1 extra point if you tweet the contest, and 1 extra point if you blog about the contest. The three winners will be announced on Dec. 11th! 67 Responses to ACROSS THE UNIVERSE Giveaway! I’d love to be considered for this fabulous contest! I work part-time in my local library and I have not only recommended the book, I’m in charge of compiling a YA Wish list of books to order in January. This one will be on my list!! 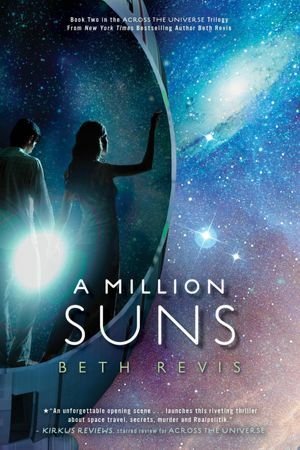 I would love to win this *_* Can’t tell you how excited I am for A Million Suns. Across the Universe was fantastic. I can’t wait to get my hands on A Million Suns! AtU is one of my favorite books of 2011, and I cannot wait to get my hands on the next one! Choose me, please! I would love to get a copy of these books! I got to read the galley for Across the Universe a while back, and I’ve been dying to get my hands on it since!!! I’m dying to read the sequel as well! Ohhh sooo exciting! 😀 I hope I win! Loved the first book and would love to have my own copy of it! OMG! Loved Across the Universe!!! And let’s not even start on A Million Suns, I’d SO love to win copies. Sign me up!!! I also tweeted about this contest. Such a great opportunity! I would love to win and I can’t wait for the sequel. I would absolutely love to win this. *-* I’ve been wanting to read Across the Universe for months and months–the premise is incredible, the cover is gorgeous, the reviews are positive, and the author is awesome. Across the Universe is amazing. I can’t wait to read A Million Suns. Thanks so much for hosting this awesome contest. I tweeted abt the contest too! I also recommened it to my libarian!! There are not enough female syfy writers. I like seeing diversity…in Space. I would love to win this book! It always seems to checked out of the library, which suggests I will want my own copy anyways. Thanks for doing such a great giveaway. Loved this book, would love to own it. I’ve been dying to read this! Oh excited! Thanks for this contest! Thanks sooo much! I’d love to win this! Hi, i LOVE Across The Universe!! it one of my favorite books and i cant wait for the next book to come out in 2012!!!! Thanks for the giveaway! I loved Across the Universe & can’t wait for A Million Suns. I tweeted (http://twitter.com/#!/Dani_Nguyen/status/141684678737395712) & will definitely recommend to my librarian the next time I’m there! I don’t know if this will win me the extra point but I AM a librarian and as soon as I read the write up on Across the Universe I insisted we get it. A Million Suns is now on order too. I love that our library has it but would love to have my own copy. Ooooh me me!! I would love a paperback copy to beat up and lend out because I hate doing that with my hardbacks. I already have a hardback of AtU but a paperback would be awesome!! I absolutely LOVED this book. I cannot wait for the sequel. I hope it’s just as epic as the first. I really want a copy of the paperback! I was one of the lucky early fans whose name will appear in the paperback! Would love to be in the running, please, if you’re willing to post to Australia. Oh I totally recommended this to my school librarian and they ordered a copt of ATU! I was so stoked. I would love to win this, and I cannot wait for A Million Suns! Oh yeah I spread the word! I showed the local librarian my hardback of ATU and they were very interested in getting one for their system. I would love this! I have been waiting for AMS for what feels like a million years! WOW! This is such a great contest opportunity! Thank you so much! I CAN NOT WAIT for AMS. I’m dying for 1/10/12!!! Thanks for the contest! Hope I win! I’m not sure if this is open only to the US (I’m from the Philippines), but if not, I hope I win! Yay! Thank you for this *awesome* giveaaway!!! ATU has to be one of my favorite books of all time! You better believe I’ve told my librarian about it! this is amazing, i LOVED ACROSS THE UNIVERSE, EXCELLENT, AND CAPTIVATING! Thank you for this fun giveaway! thanks so much for this awesome giveaway! I just placed a request at my library to read across the universe, would LOVE to win these books! Would love to win! LOVED ATU and can’t wait to read A Million Suns. I am a high school librarian and I recommend ATU often to my students. Thank you so much for this giveaway! I’d love to enter! and I’d definitely recommend this book to my friends and librarians. Oh! I just loved Across the Universe and the ending almost made me build a time machine in my backyard just to get A Million Suns. I cannot wait until it comes out and see what happens on Godspeed. LOVE ATU! I already have it in hardcover but would love a paperback copy, too, and of course A Million Suns! Thanks for the FANTASTIC giveaway!! I’ve loved ATU since it first came out and I always will! Ah! I love this book! Thanks for giving me a chance to read it again! Don’t enter me, because I’ve read (and adored) ATU and will definitely pick up the next book. I’d rather others win. (And I just won a book like a week ago.) Just wanted to comment on the great contest. So excited for this contest. Its awesome!!! 1. So I got a total of 4 Points. I recommend the book to one of the librians in the brownsville public libray. You guys are great! I’m so glad you are loving this contest. Yeah Emma for this being the hightlight of your day. That totally made my day!!!! This is a wonderful contest you’ve got going. I already have a copy of Across the Universe which I very much enjoyed. As for A Million Suns I won a pre-ordered copy a while back. (Waiting patiently.) So…you don’t need to enter me! Let someone else be the lucky winner! Don’t enter me since I already have Across the Universe. I’m so looking forward to A Million Suns. I have it on pre-order. I’m looking forward to A Million Suns so much. My library has not ordered it yet.